Well once again the time got away from me, and it's now been over a month since my last post. There has been a lot of water over the dam in that time and I will do my best to catch up completely. The megayacht Fountainhead. The glow on her bow is from underwater uplights on her bulbous bow. Before I get into the more mundane parts of the update, it's worth spending a moment on Hurricane Harvey, which at this writing is still wreaking havoc in Texas. Many of our colleagues in the Red Cross are either already there or are waiting for transportation to become available; both Houston airports are still closed. We also have friends and family in Houston, all of whom are hunkered down and completely surrounded by flood waters. As long-time disaster relief workers, it is incredibly hard for us to sit here in comfort and watch this unfold without being able to go help. A disaster of this scale strains the resources of all relief organizations, and as the Red Cross possibly begins to run out of trained personnel we are keeping open the possibility of extending our stay here so one of us can fly to Texas to help. The demands of the boat (and the cat) dictate that one of us will need to remain here with the boat. 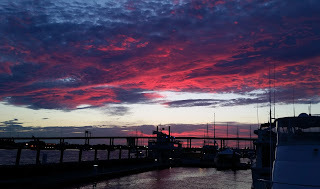 One of the numerous spectacular sunsets from the dock. Ground zero for landfall was Port Aransas and Rockport, and you may recall we were there just three short months ago. The rapidity with which this system developed and moved ashore left no time at all for a boat such as Vector to escape, and this is precisely why we made haste to leave the gulf as hurricane season got under way. The very marinas where we stayed in Rockport and Port Aransas suffered major damage, with some less extensive damage where we stayed in Corpus Christi. 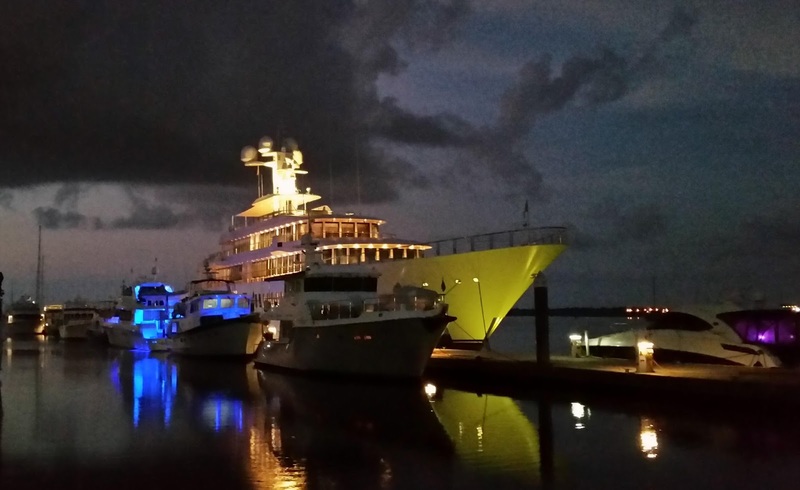 Galveston and Clear Lake, also on our recent itinerary, also saw damage to vessels. Our hearts and thoughts are with the people of Texas and the relief workers and first responders who are there to help them. If you would like to help, please send money, and nothing else. I have written about this here before, more than once, most recently in this post. Please read it, and follow the links, to learn why sending anything at all, no matter how much sense it seems to make, actually hampers real relief. Projects mean parts, and parts means boxes, and Angel loves boxes. 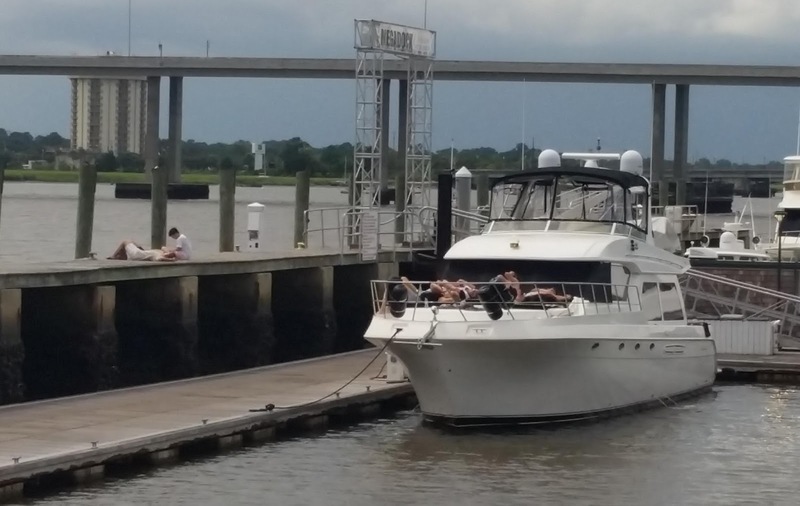 Speaking of tropical storms, you will recall we suffered some damage to our flybridge top in Biloxi during Tropical Storm Cindy. In my last post I shared some of the work I had already done to remove hardware from the top so that the canvas could be removed. In fact, a large part of my time across the next three weeks also went into the project, which proved even larger than anticipated. The work was extensive enough to warrant it's own post, which will be forthcoming shortly; I'm happy to report that it's complete and the repaired canvas is re-installed. Toward the end of our cruise here from Fort Lauderdale, we rolled past the 4,000-hour mark on our engine. 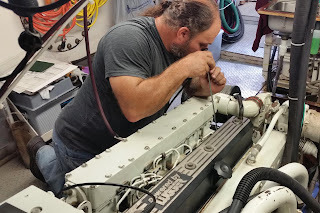 The engine had just 1,166 hours on it when we bought the boat, and I did the 2,000-hour service myself, adjusting valve lash, tightening fasteners, and adjusting the belts. Given some of the issues we've had recently and that it's our only means of propulsion, I decided to enlist professional help for the 4,000-hour service. This really never gets old. 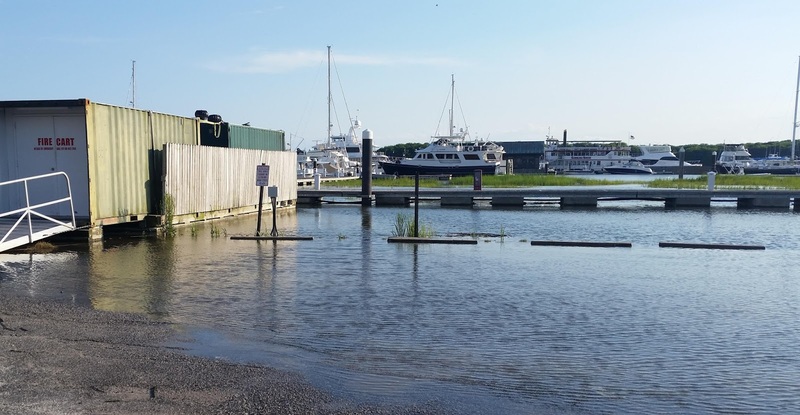 Those issues included a slow trickle of diesel fuel into the bilge, excessive soot on the transom, and a very slow consumption of engine coolant. We isolated the fuel issue to a leaky fuel return line during our passage here, and our technical guru at Lugger felt the coolant consumption was most likely a pinhole leak in the aftercooler. He suggested looking at the fuel injectors as a result of the extra soot. We called the local Lugger service dealer in town, who also happens to be the local injector service shop, and scheduled a tech to come out. This was a two-visit proposition, since the injectors would have to be tested and serviced offsite. Long-time diesel mechanic James came out, bringing with him some specialized tools for extracting the injectors; most notably a sort of slide-hammer with threads for the injector at one end. He very quickly pronounced the engine in excellent health and got to work removing the injectors, which looked pretty good. Injectors out for service. Not bad at 4k hours. The shop cleaned and tested all six injectors, which all turned out to be within spec and not in need of rebuild or replacement. A couple of days later, James came back out to re-install them, bringing with him a borescope to inspect the cylinders. 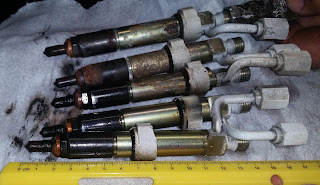 The borescope inspection revealed the cylinders in good condition, with crosshatch still prominent on the liners, and normal valve deposits. While the injectors were still out, making it easy to turn the crank by hand, we did the valve adjustment. Inspecting the cylinders with the borescope. James had all the injectors back in place in short order and reassembled the fuel system, to include new copper crush washers on all the return line banjo fittings. The engine fired right up and ran perfectly, but our fuel leak was still with us and, in fact, had increased in rate. It had moved, though, from the number four to the number six cylinder. Closer inspection revealed that the leak was not at one of the return banjos as we had surmised, but was instead coming from the return pipe off the injector body itself. Other than that, all was good, and James wrapped up his visit. The leaking injector is not really something that can be repaired, short of ordering an empty injector body and moving all the guts of the old one to it. I ordered a brand new injector from the local Komatsu dealer, and the leaking one has been relegated to spare status. It works, and could be pressed into service in an emergency. I was able to install the new replacement myself and the engine service is now complete. We opted to just live with the minuscule coolant consumption until it becomes worse, rather than try to pull the aftercooler for testing. One of my many side projects. 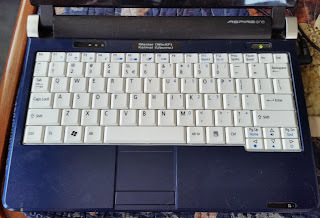 The keyboard on the backup chart computer quit. 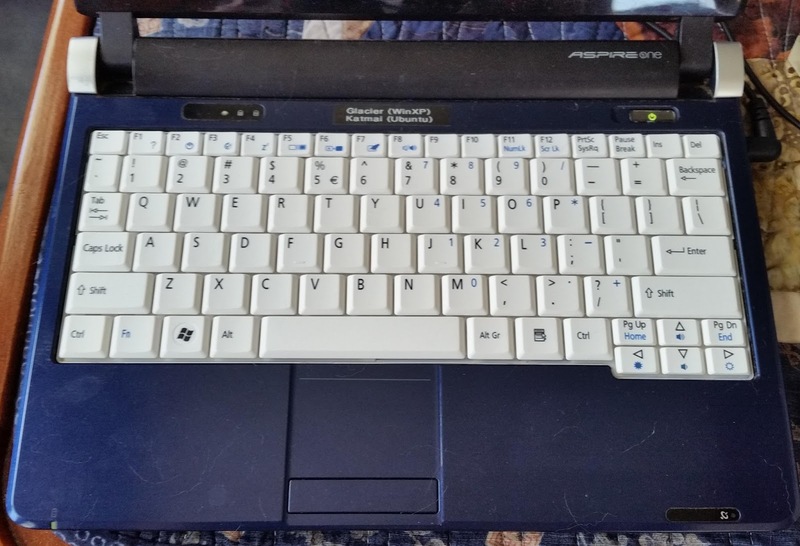 I replaced the black original with this white aftermarket for nine bucks. Vector was not the only one with scheduled maintenance here in Charleston. As long as we had a couple of months in place, we've been catching up on doctors' appointments. We've both already been to the dentist, for example, and I've had my regular PSA check. Louise had a couple of eye doctor visits, necessitated by sudden appearance of extra "floaters" and peripheral flashes, sometimes the early sign of retina issues. She's been given a clean bill of health, though, and now I'm the only one due for a checkup. We also found a good local massage therapist and we've each had two or three sessions. 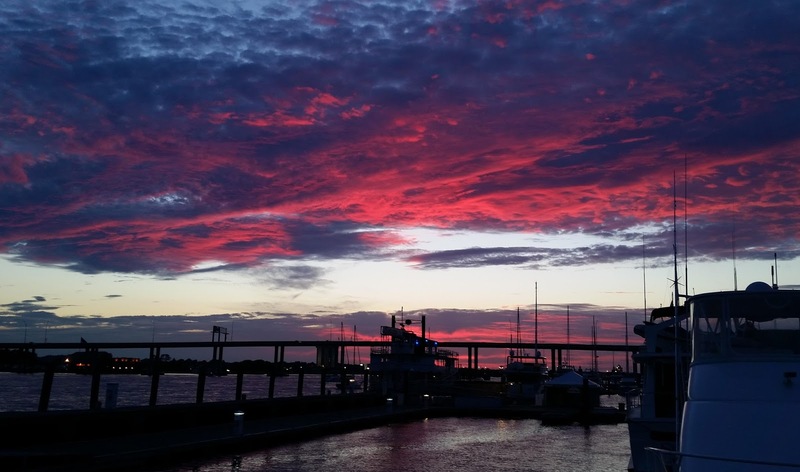 Speaking of eyes, the reason we chose Charleston as our hurricane-season escape and not someplace further north (and thus even lower storm probability) was for the opportunity to see the total eclipse last week. 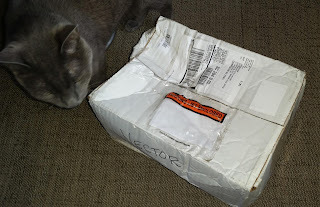 To that end, Louise had ordered some fancy solar viewing glasses with nice plastic frames on Amazon, nominally ISO-certified, which we've had in our possession for over a month. Then, just a week ahead of the eclipse, we got a note from Amazon saying they could not verify that the glasses were really ISO compliant or safe, telling us not to use them, and providing a full refund. This was just a day before we left town for a week. I spent the better part of a morning calling everyplace I could think of to get replacements on short order. Every place in town was sold out, and I think you could have scalped eclipse glasses for a tidy profit. The marina had a whole case of them, but they, too, learned their supply was tainted and they discarded them. It turns out that the Charleston Visitors Bureau had ordered 100,000 glasses for the expected rush (over a million came), and I was able to grab a few pair from the downtown visitor center at a dollar apiece just before we left town. 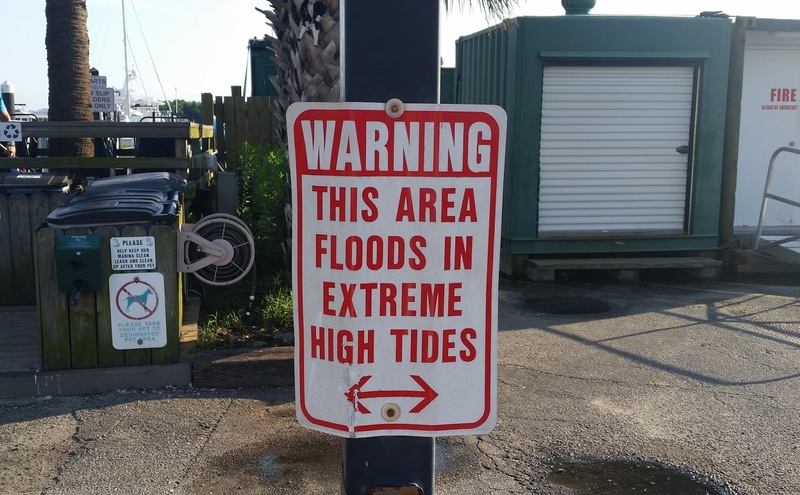 The sign was not to be taken lightly. Those are parking bumpers. Remaining here for the eclipse meant we could not get Vector all the way to New York in time to visit our west coast friends who make their annual pilgrimage there this time of year. But with the boat securely ensconced in a full-service marina, and New York a relatively short hop away, we decided to revisit one of our old traditions, rail travel. I made round-trip reservations on Amtrak well before we even arrived here. 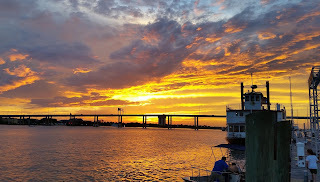 We deposited Angel at a nice kennel in Mount Pleasant, secured Vector, had a nice final dinner here in town, and then took Lyft out to the depot in North Charleston to board the Silver Meteor to Penn Station. The train was an hour late and our roomette was already made into bunks when we boarded, so we missed out on a bit of "the experience." Amtrak is seldom on time. At least the east coast trains have a roomier upper bunk than their western counterparts, with a window even. Another pair of trains on the LIRR got us much of the way out to Southold on the North Fork. We had a nice visit with our nieces and their extended family, ending up in Rockville Center and then onto another train to Manhattan, where Louise reconnected with a college friend whom she has not seen since graduation. 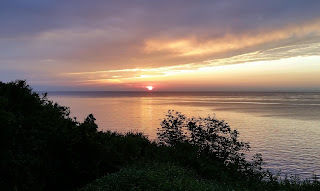 Sunset over Long Island Sound from Southold. Two more trains brought us to New City, New York, where I have family, and we had a nice couple of days with them before reversing our steps to Penn Station and our return Amtrak. The train ride to New City was along familiar yet changed territory, as it is the train I rode daily to college in Hoboken for the better part of four years. We had a nice dinner on the train, our ninth and final train of the trip, and all too soon the steward was knocking on our door at 04:30 for our disembarkation in Charleston. The sleepy little station where we had boarded with just a handful of people a week earlier was overwhelmed by the over 100 people who disembarked with us, a wave of eclipse tourists arriving by every possible means. I called for a Lyft when the train was still a few miles from the station, to get a jump on the crowd. 300' Fountainhead behind Vector. It made even the 150' yachts look tiny. I've been more than a full day late on Amtrak more than once, and so we arrived more than a full day early, Sunday morning. 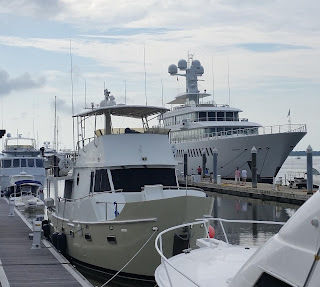 We returned to the marina to find Eddie Lampert's 300' megayacht, Fountainhead, taking up a fifth of the Megadock behind us. By Sunday at dinner time the entire town was jam-packed with tourists, and every restaurant was sold out. We made dinner reservations first thing in the morning. Very stylish. On the boat deck during one of the clear moments. We did not have the best weather on eclipse day, with widespread cloud cover. A gap would open up periodically, and we would look up to see the eclipse progressing whenever it did. It was touch and go as totality approached, but we still managed to get a good view with a mostly clear opening at the very beginning. 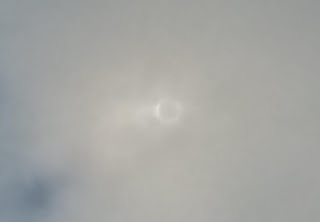 We got to see the corona through a very light cover, and the clouds moved back in just as totality ended. I don't have a camera which can capture any of this, but I did the best I could with my phone. 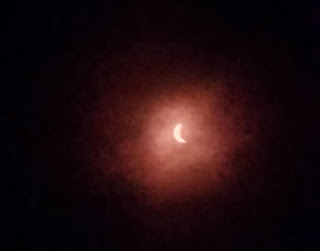 A view of the partial eclipse through my $1 solar filter. During totality we were able to use our binoculars. which we had the foresight to bring up to the boat deck with us. Even with the very slight cover it was spectacular. I did not think to capture a shot of our surroundings, which were more like twilight than nighttime. 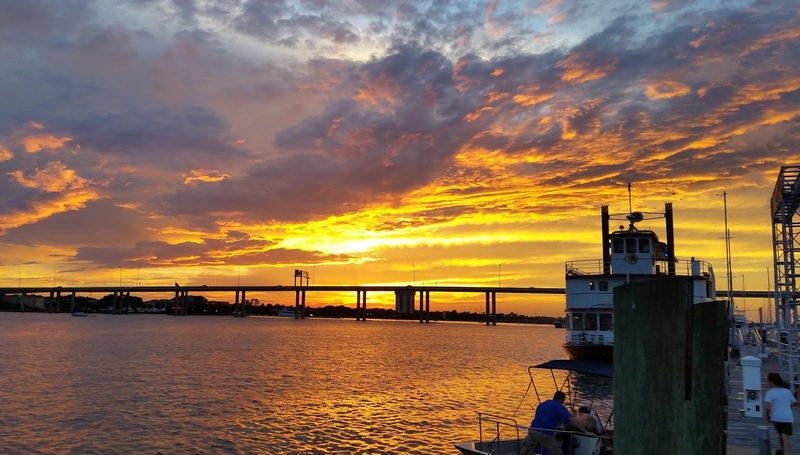 Someone later aptly described the view as "sunset in all directions." The street lights and navigational lights did come on; it was all quite surreal. We had a better view than this, but I was able to snap this shot just as the clouds closed back in. The euphoria of the eclipse was short-lived, as each of us got word of medical issues in our respective families early in the week. 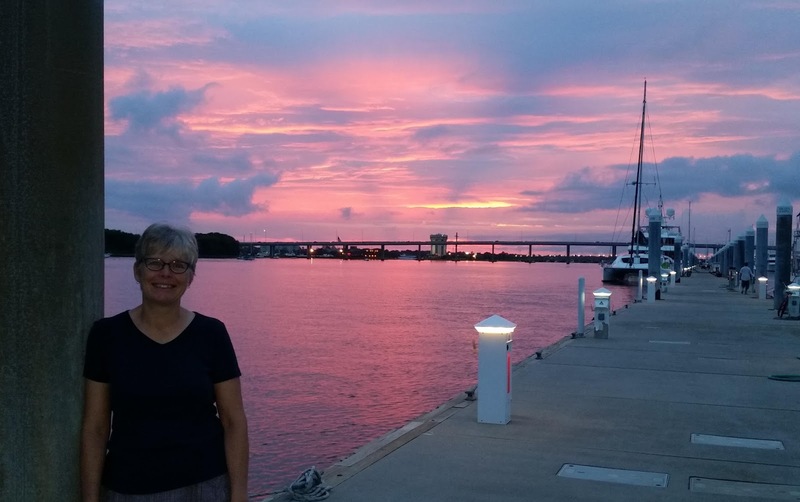 Louise will likely be flying to California in the next month, and we'll probably extend our stay here in Charleston rather than continuing much further north. We had hoped to make DC this season but that's looking unlikely now. If you look closely almost every boat is packed. 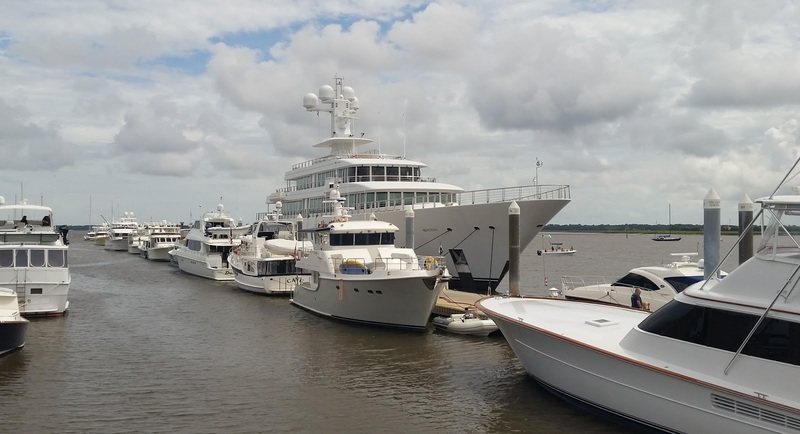 Fountainhead dwarfs the 65-footers in the foreground. The other direction. The marina was mostly full for the event, and many boats were just hanging out in the harbor. 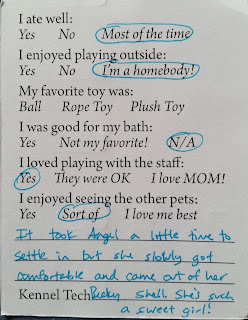 Both the boat and the cat were mostly no worse for wear when we got back from our trip, and the kennel even gave Angel a "report card" for her stay. The one exception is that our air conditioners were inoperative when we returned. They'd come on, but shut down shortly afterward on lack of cooling water. The water here is full of muck, and we'd already cleaned the strainer twice and also backflushed a bunch out of the units themselves. 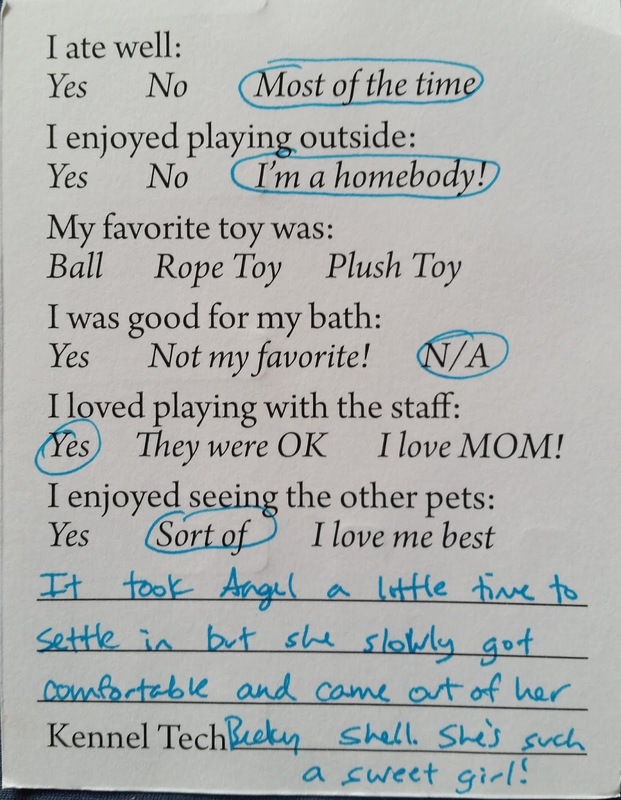 Angel's report card from camp. 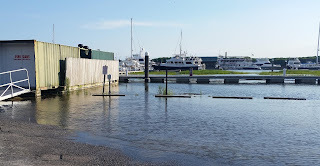 We were able to get by with our two air-to-air units, Meriwether and Mr. Roboto, until a diver could come out to clean out our sea chest, which we correctly suspected had accumulated significant growth with the AC pump running full-time. We needed the bottom cleaned anyway, and will need it once more before we wrap up here. That fixed the issue and we are once again cool. We left Meriwether running the whole time we were gone, and it did a great job of keeping the whole boat dry and reasonably cool. Thursday was our thirteenth "nomadiversary," wherein we celebrate closing the door on our last non-moving home, and moving full-time to a nomadic life. We had thought to have a celebratory dinner at our club downtown, but neither one of us was in the mood after the horrible fatal shooting and hostage situation at Virginia's on King street. I had just dropped Louise off at the eye doctor for her followup when we got the news, and I spent a half hour getting a safe-and-well message posted everywhere I could. By dinner time I was coming down with a horrible cold anyway, one that I am just now getting over. Louise is about a day behind me; we think we picked it up on the New York trip. 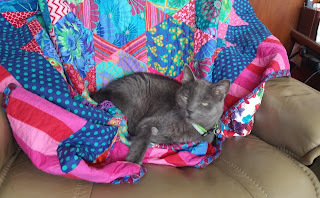 I was out of commission Friday and Saturday, too miserable to even work on the blog. Yesterday I spent installing the replacement injector before getting today's photos prepped and uploaded. 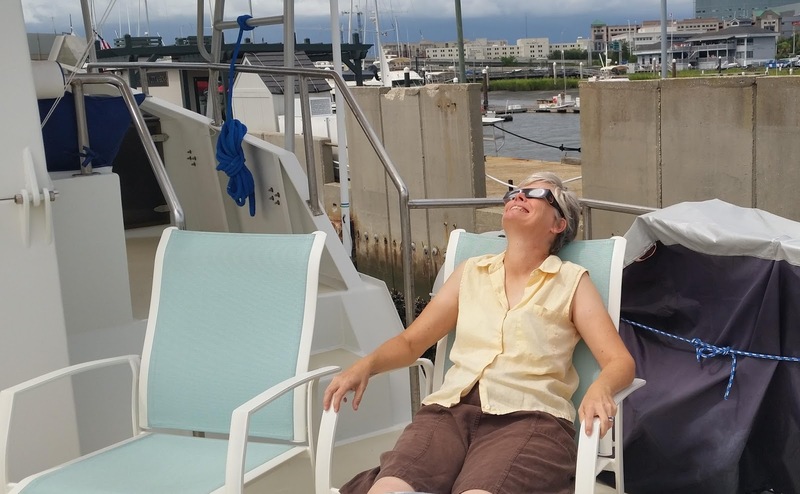 Today we find ourselves trapped on the boat by yet another tropical storm. We are in the outer bands of Tropical Depression Ten, which by tonight will become Tropical Storm Irma, somewhere just offshore of right where we're sitting. It will graze along the Carolinas and probably flood the Outer Banks before heading off to sea. I was able to get a few groceries before the rain hit first thing this morning, and it's been raining ever since. Sunset on the day of the eclipse. 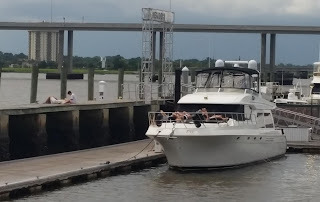 Tomorrow is more of the same, and I hope to crank out another update here, detailing the flybridge project. With any luck the storm will have passed by the time we need to head out for an afternoon appointment. We'll be right here in Charleston for the foreseeable future, and I will post an update here once we have more firm plans moving forward.